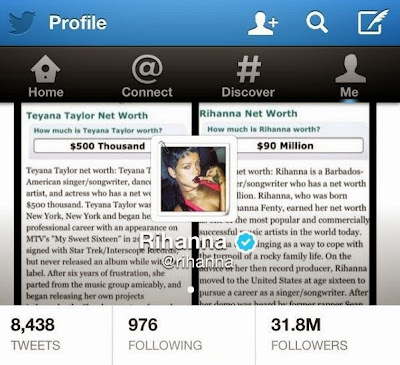 So this is Rihanna's Twitter background right now. Plain and simple, that's a Super Mario fireball right on Teyana's face. I'm not following the brawl because it looks like your standard cat fight that really has no start or end point, but it appears that shots have been fired. I don't know too much about Teyana other than the fact that she can put together a mean hashtag and is the General of the Butterface Army. On the flipside, I know way too much about Rihanna. "We Found Love" has been my favorite song for like 621 consecutive days. Also, I definitely know that $90M is 89 1/2 million dollars more than $500K. Math is math. PS. Can I just have that ".8" amount of Twitter followers that Rihanna has? It's still downright criminal with the amount of people that read this blog daily that I don't have more Twitter followers.